I used 1/4 tsp less salt and added 1 tsp vanilla. Loved these pancakes. My boyfriend said that they're better than any box brand and that they had the taste of "sugar cookie dough." 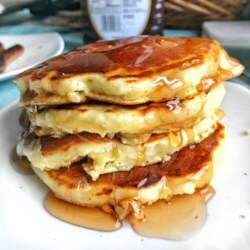 Goodbye Bisquick, I'm keeping this easy and great breakfast recipe! Thanks Verona!